You can still hear Chris Berman saying “Marshall! Marshall! Marshall!” on NFL Primetime. Can’t you? When we think of great players we tend to think of them at their zenith. 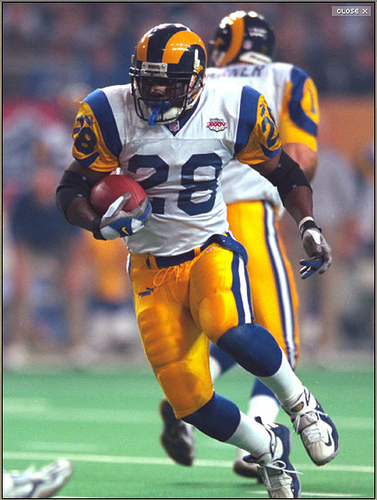 For Marshall Faulk it was definitely the years of “The Greatest Show on Turf” where he played his way into the Hall of Fame in just three years. The earlier years were just a harbinger of things to come. 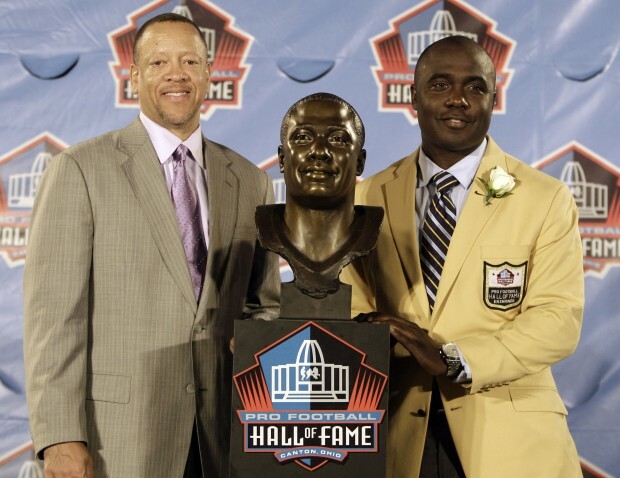 Yet when I think of Marshall Faulk, I think of a faster version of Thurman Thomas. Better yet, if we spliced Thurman Thomas with Barry Sanders, this is the hybrid that would have been created. In fact it was Sanders departure that swung the door wide open for this talent to finally get his acclaim on a world wide basis. When Barry retired, the NFL lost it’s instant highlight reel. We were spoiled as fans because week after week we saw something spectacular and weren’t sure if we’d see that again. Enter Marshall Faulk. The NFL world was mourning the loss of John Elway and Barry Sanders to retirement. Then we were thrown for another loop when the Indianapolis Colts selected Edgerrin James ahead of Heisman Trophy winner Ricky Williams. 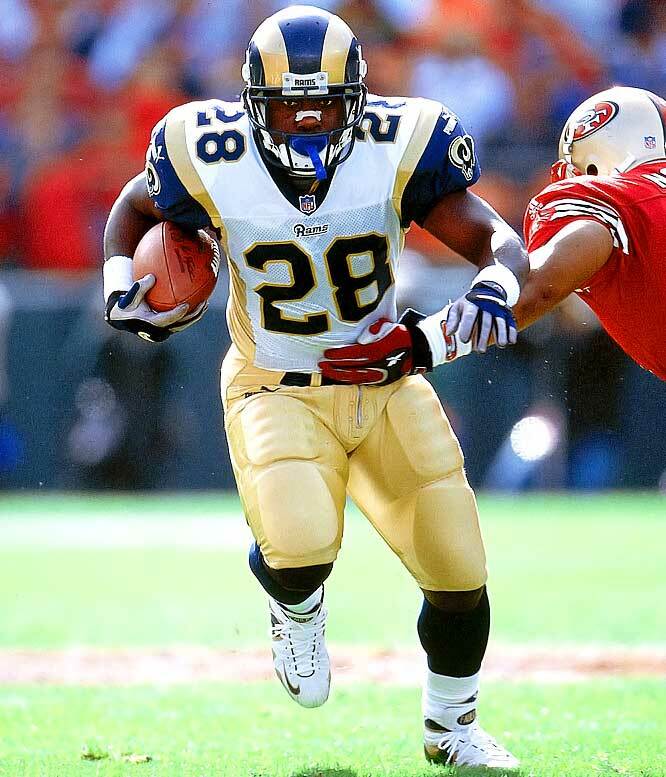 Almost as an afterthought Marshall Faulk was traded by the Colts to the Rams to make way for James. Instantly, I remember saying this is the Football Gods reversing the Eric Dickerson trade. Referring to the Rams trading Dickerson, the greatest runner of his era, to the Colts in 1987. No one was really paying attention to Marshall Faulk going to St Louis yet being in Anaheim at the time, I was still in the Rams television market. My response was a flippant comment and not a premonition but it turned out to be. History would judge this trade on what happened with both teams. I thought the Colts had made a mistake letting Faulk go. So who won the Marshall Faulk / Edgerrin James trade?? The St Louis Rams became “The Greatest Show on Turf” thanks to a forgotten running back who could play receiver, had moves and an effortless running style with a burst. In three seasons (1999-2001) he rushed for 4,122 yards averaging 5.4 yards per carry while scoring 59 touchdowns!! Won 2 NFL Offensive Player of the Year awards and an NFL Most Valuable Player Award while taking the Rams to 2 Super Bowls. 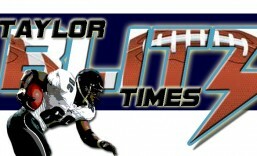 They won Super Bowl XXXIV beating the Tennessee Titans 23-16. 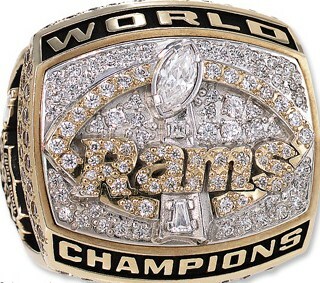 Before Faulk the Rams had not been league champion since 1951. In the 1999 championship season alone, he joined Roger Craig as the only other back to gain 1,000 yards rushing and receiving in the same season. When Craig did it he had 1,050 yards rushing, 1,016 receiving. Faulk burst by that with 1,381 yards rushing and 1,048 yards receiving while sitting out most of the last 3 quarters of the finale against Philadelphia. That game the Rams lost 38-31 and Faulk would have stretched his numbers further had he played that game and the 4th quarter of 4 other blowouts at home. Not factoring that in, Faulk still broke Barry Sanders record for total yards from scrimmage with 2,429 yards. Greatness. He was the impetus for one of the NFL’s greatest champions. How do you follow up a season like that? How about narrowly missing another 1,000/1,000 season with 1,359 yards rushing and 830 receiving while setting a new record by breaking Emmitt Smith’s TD record with 26 TDs. In 2001 he led the league with yards from scrimmage for the 4th straight year tying the record of Thurman Thomas. Yet all four of Faulk’s seasons were over 2,000 combined yards where Thomas only had 3. Now when you look back and see that in 1998, in his last season with the Colts, he ran for 1,319 yards and caught passes for 908 yards. He had four consecutive seasons where he flirted with 1,000/1,000. He broke records and tied another of Hall of Fame running backs, how could he not be enshrined with them with numbers like that?? All this to lead the Rams in becoming the first team to score over 500 points in multiple seasons with 3 (1999-2001). The Rams also averaged 32.6 points per game for those 3 seasons which was the best in history narrowly beating their 1951 predecessors with just under 31 points. Marshall went on to finish his career with 12,279 yards rushing with another 6,875 receiving and 136 overall touchdowns. Yet it was this amazing 3 year run that catapulted him to the halls of Canton. Now its interesting to note that while Faulk was doing all this, Edgerrin James (The U) twice led the league in rushing. This entry was posted in Historic Writings and tagged American football, football players, Greatest Show On Turf, Indianapolis Colts, Marshall Faulk, NFL History, NFLplayers, Pro Football Hall of Fame, sports, St Louis Rams. Bookmark the permalink. The colts purposely benched him so he wouldn’t achieve those numbers in 1998 so they could save money. They claimed he was late to a team meeting.